Normally, dessert in my vocabulary does not translate into anything with fresh fruit. 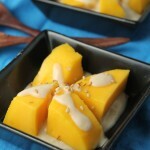 But this Thai mango with coconut sauce is AMAZING and will knock your socks off!!! Don’t get me wrong, I really love fresh fruit, but it doesn’t always satisfy that treat craving known to hit after mealtimes…aka CHOCOLATE! This Thai mango with coconut sauce is a traditional Thai dessert, normally served with sticky coconut rice (which is really delicious too). I have simplified it and gave our waistlines a bit of a break by leaving that out here. The coconut sauce will really knock your socks off, the trick is the balance between sweet and salty….so don’t leave the salt out. You can play with the sugar/salt a bit, but do it by tiny fractions to your own tastes. It is also important to note that you will need a particular mango for this recipe (called by so many names): it’s the only mango I really like, and they are coming into season now. How do you pick the best one? Thai/Naftali/Champagne/Honey Mangoes…whatever you call them, they are the best! To pick a good one, look for a uniform orange-yellow skin that yields slightly to your touch. Sometimes a subtle wrinkle to the skin works too. Like fruit based desserts? Here are some more you could try! 1 cup canned coconut milk I linked to the ONLY brand I use..flavor wise it is THE best, and no fillers!! 1/4 teaspoon sea salt (scant) I linked to the kind I buy..still has ALL it's trace minerals! Whisk together the sauce ingredients in a small saucepan. Over medium-low heat, bring the mixture to a gentle simmer. When mixture thickens, remove from heat and set aside. Prepare your Thai mangoes (see picture). Peel and slice them any way you like! Serve freshly sliced mango with a drizzle (or slathering) of coconut sauce! Sprinkle with toasted sesame seeds if using! I’m not really a fan of mangos but maybe because I haven’t tried this variety? Will look out for these, thank you! I don;t like any other mangoes Darryl!! That perfect balance of sweet and salty is so important!!! YES! I need more mango in my life! This looks delish! Mango desserts are the best ! So summer perfect. YUM ! I love fruit based desserts! That sauce sounds simple, but delicious! What a fresh treat for these hot summer months. Yum! YUM! I love love love mangoes. And this looks delish! This has been one of my favorite flavors since I was a kid and my mom and I would get this at our favorite Thai restaurant. Brings back good memories. Yum! I also love Champagne mangoes, their flavor is so incredible, and what a great idea to have all the same flavors but simplified! So simple and delicious! Perfect for summer. Yum! 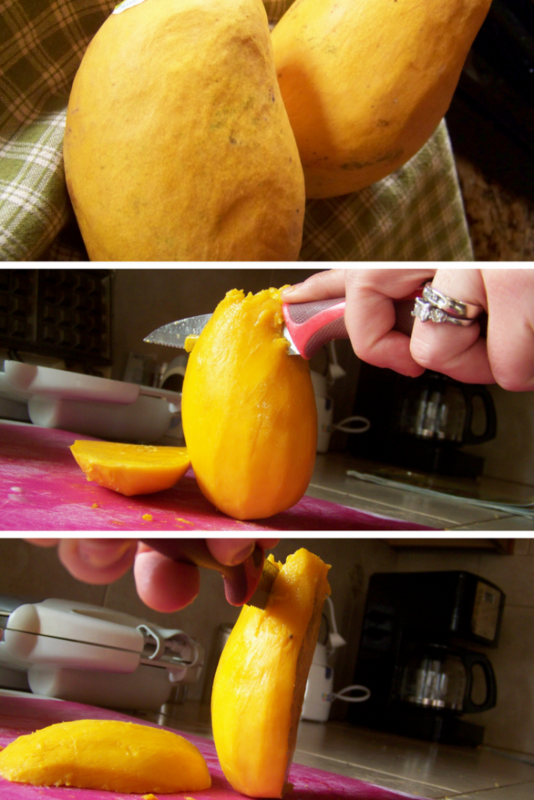 I’ve never tried mangos this way but now I must! Yum! 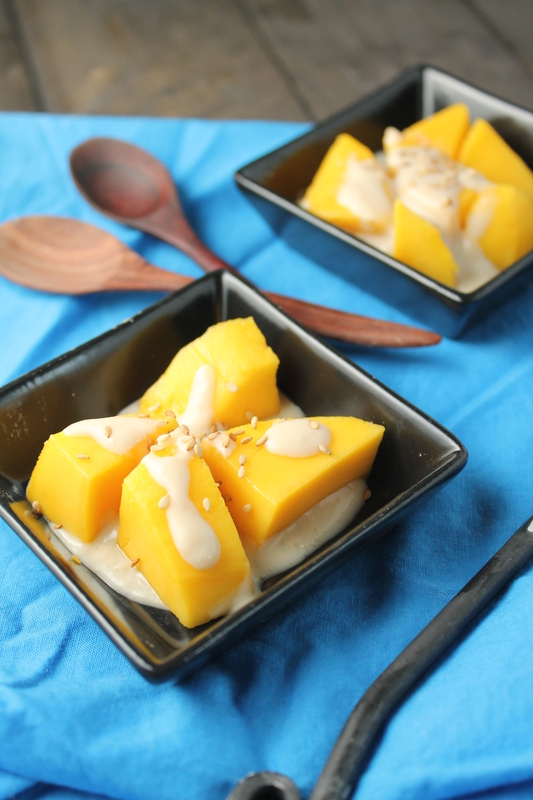 I can’t wait to try this gluten free Thai mango dessert recipe. I just featured it on my round up of healthy Gluten Free Asian Recipes: http://dontmesswithmama.com/gluten-free-asian-recipes. Sometimes simple recipes are the best. 😉 This one sound amazing! Thanks for sharing it at Savoring Saturdays! This looks so good. I’ve made something similar in the past. I also made a Paleo Pad Thai that this would go really great with. Looks like we both got featured on Gluten-Free Friday (that’s where I saw your post for this) Love your site. Wow, I have this one my favorites list for this week! YUM Got it linked up at the Gluten Free Fridays pinterest board and tweeted out! I love the tropical combination of coconut and mango! Thanks so much for sharing Tessa! Oh my gosh, yummy! When can I come over for a meal? 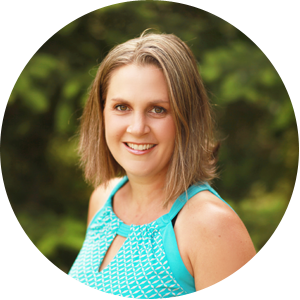 Thanks for linking up on Natural Living Monday! I can’t wait to see what other tastiness you have up your sleeve. This sauce looks delicious! Hope you are having a great weekend and thank you so much for sharing with Full Plate Thursday. Yum! We’re a traveling real food family in Asia now, so this will work perfect for us and easy ( and super cheap) to find the ingredients! I had not heard of Thai mangoes before – I was interested to learn about them. Your dessert looks delicious. I like fruit based desserts, and this one is extra-special with the coconut sauce. Oh, saw this on Motivation Monday…should not be looking at this before breakfast. I need to buy some mangoes…soon!